This is the first little pdf of Mór Games’ Council of Lords-series; it clocks in at 22 pages, 1 page front cover, 2 pages of editorial, 1 page ToC, 1 page SRD, 1 page advertisement, leaving us with 16 pages of content, so let’s take a look! So, what is this? 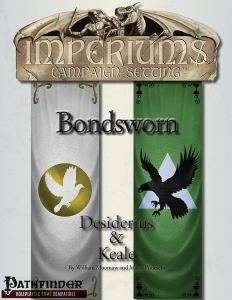 There is no single easy answer to this question, but I will try: A bondsworn constitutes a lordship and commons and as such, this should be considered a kind of sourcebook that can be used to flesh out either components of the Imperiums Campaign Setting…or to insert the material into a kingdom building context, but unlike similar supplements, the focus here does lie on the roleplaying aspects: While there are full statblocks to be found herein (alongside abbreviated ones that contain basic info for RP-heavy non-combat encounters), the captivating concept here lies less in the stark numbers and more in the narrative potential. You see, to me, the work in fleshing out the holdings of a given lord or clan are not necessarily founded on the crunch-work – there are quite frankly enough supplements out there to deliver that. Instead, I consider the work to be in something more devious and ultimately harder to achieve component: Weaving a convincing tapestry/political landscape/structure. To drive home the point I’m trying to make: How many of us have endeavored to properly depict interesting struggles between barons, how many books have you read where that fell terribly flat of its own ambition? Well, and then there would be one famous example where this worked almost perfectly – I’m obviously talking about “A Song of Ice and Fire.” Call me a nerd, but one of the developments in the Game of Thrones TV-series that irks me to no end is that the gross oversimplification of the political landscape is catching up to the series, making some of its more intricate elements coming apart at the seams. Where is this detour going? Well, essentially, you should picture this book as a little look at two “A Song of Ice and Fire”-like noble houses, supplemented by some crunch. From mottos and traits to common knowledge regarding the respective houses, we have, ultimately here, two inspired houses with notes on the ranking members, DCs and the like all presented, to the point where, beyond known information on key players, we also get information on properly playing such a character…including reputation, naming-conventions and the like. If you’re a bit rusty, fret not – there is a handy translation provided – and yes, this direct quote of Minne-traditions is represented in the half-elven nature of most Keales as well as in the theme of the bondsworn. Oh, and yes, even the BANNERMEN of the bondsworn have their own motto! This focus on smart, narrative potential is btw. also mirrored in e.g. an artifact-level blade associated with a poem – reciting a line activates the power of the blade (regular English suffices here, btw.) – which, while not perfectly formatted, still adds a level of poetry, of immersion into the material here that is absent in so many supplements. Better yet, there is a gamemaster section that not only provides inspired hooks, it also capitalizes on the genius emergence-rules innovation of the Imperiums setting, providing a unique benefit for both bondsworn featured herein. Editing and formatting are very good on a formal level, though some missing italicizations for spells and minor hiccups like that do exist. Layout adheres to Imperiums’ 2-column full-color standard, which, while beautiful, makes this slightly less printer-friendly than it could be. The pdf comes fully bookmarked for your convenience. William Moomaw and Mario Podeschi deliver a most uncommon pdf here – one I wholeheartedly endorse you to check out – why? Because it is a supplement that does not exist primarily to justify numbers or the like, to provide bloat in that regard. Instead, what we have here is an inspired book that brims with narrative potential – not only for the Imperiums campaign setting, but also for others. The strength of this supplement does not lie exclusively in the rules presented, though they are neat: It is in the intelligent writing, in the well-crafted prose, in the captivating details that this pdf comes to life. It may not be perfect, but there is a reason I quoted “A Song of Fire and Ice” in this review: What we have here is a thoroughly intriguing political sandbox that practically demands expansion, that lives by virtue of the strength of its inspiring prose and by the grace of its daring, unconventioal premise. It is, pretty much assumed in the 3pp-scene that crunch sells better than fluff and that groups are primarily interested in bashing foes and taking their loot and while there is crunch here, I certainly do hope some of you take a look at this pdf and buy it; What we have here are wonderful political factions that can drive whole campaigns, if you want them to – lavishly detailed and crafted with love and passion that oozes from the pages, factions that hint at the vast potential of this series. This is a great read for a truly fair price, so let’s refute the notion that we gamers prefer cardboard cut-outs over detailed, diverse factions and political landscapes. In one sentence: This is a true, capital letters ROLEplaying supplement. If my gushing rambling was not clue enough -I love this book. While not perfect, I will still award it 4.5 stars + seal of approval for its superb writing, rounded up for the purpose of this platform, with the ardent hope we’ll get to see more. You can get this flavorful little book here on OBS and here on d20pfsrd.com’s shop!